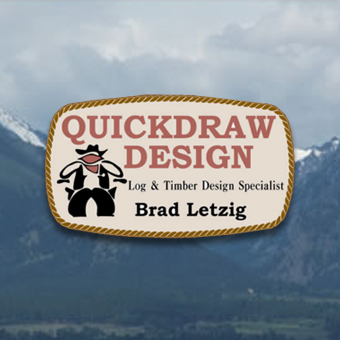 What separates Onward Log Homes from all the other log home companies? We believe that with our commitment to a quality product and the best customer service available, we have well established ourselves in our industry. Being a family run organization and dealing directly with our customers has helped us to provide the personal touch. Onward Log Homes experienced and dedicated staff will guide through the design/ build stages personally and you will never have to deal with any dealer networks. What kind of maintenance comes with owning an Onward Log Home? This is a major concern with log home enthusiasts. 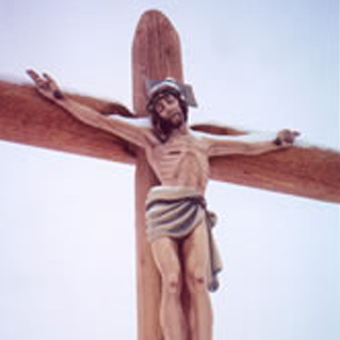 Wood has always been a higher maintenance material in comparison to all other man made products. Through careful design of a log home it is very typical to provide larger eave overhangs as well as areas that will help protect the logs from damaging UV rays and exposure to wind and rain. 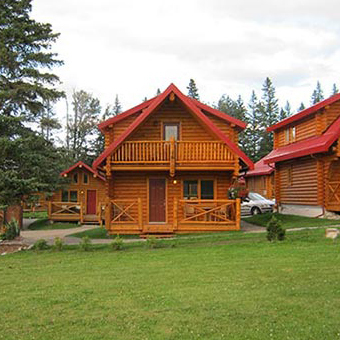 With modern stains and protectants formulated specifically for log homes, the maintenance has been reduced dramatically. However, having said that, there is no substitute to an annual maintenance program that will help maintain the beauty and aesthetic appearance of your log home for many years to come. A simple cleaning of your logs each year to remove any dust or grime that may have collected on your logs will greatly increase the period of time between a complete recoat of stain. In most cases only certain areas may have to be touched up on a yearly basis to maintain that "Brand New" look. In short, all logs or wood will have to maintained more than a man made product, however the maintenance is by far less than in the old days. When you look at the pictures on our website you will notice that everyone of our projects is stained with an attractive high quality stain that brings out the best in every Onward log home,cabin,Tru-Log sided and Half Log sided project. We wholeheartedly recommend Sansin Stain for all our clients and contractors. They are a reputable Canadian company located in Strathroy, Ontario. Please check out their Website www.sansin.com. How many floor plans do you offer? 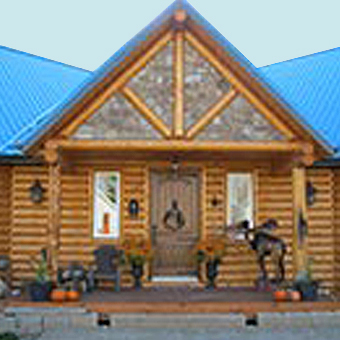 We have several floor plans of log homes that we have built over the years. 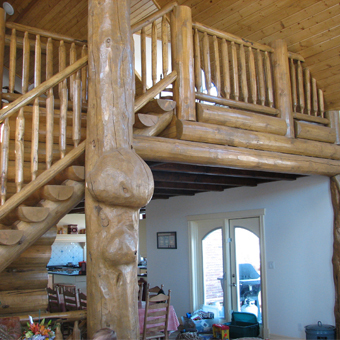 Typically we build custom designed log homes to meet our customer's desired features. Through a consult with our log home consultants it is very likely that a conceptual set of plans can be identified which will become a starting point for the design process. What comes with your log home package? 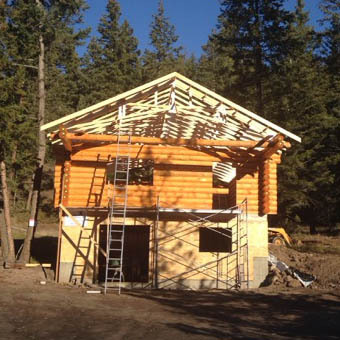 Onward Log Homes is proud to specialize in the creation of a high quality log structure there fore we do not offer a complete “house” package which may include doors, floors, roofing materials etc. 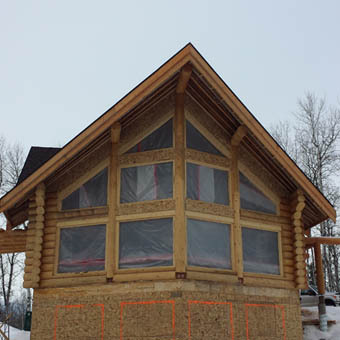 The log home structure that you will receive from Onward Log Homes will contain the complete log structure as identified through the design process, approved fasteners above the sub floor ,lateral groove polyurethane foam gaskets and a flexible membrane caulking for the corner notches. Typically complete construction drawings and field & shop drawings are also included. Who builds the log homes? We are proud to be involved with many highly experienced General Contractors throughout North America. Typically a general contractor from your local area will over see the total project. It is very common for your general contractor to provide the necessary sub trades to complete the various duties. 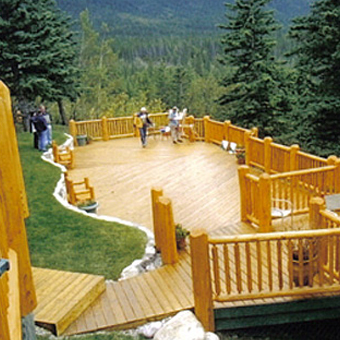 In regards to the actual assembly of the log structure, an experienced crew can travel to your site to assemble the log structure portion of your log home. We are also pleased to announce that we are one of very few milled log home companies that offers a complete pre-stack at our production facility of your log structure and reassembly on your site. This helps to control onsite expenses and timelines. How well insulated are your homes? 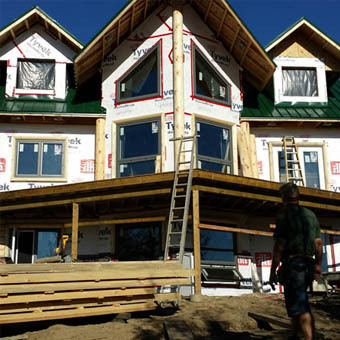 Log homes, if constructed properly, are extremely energy efficient. This is because of thermal mass. In a log home, when you heat the home during the daytime the logs absorb and hold some of that heat and when the house cools down during the night the walls radiate the heat back into the room, maintaining a more comfortable temperature. In the morning, the reheating cost of a log home is not as high as a conventional home, therefore substantially reducing fuel bills. There are three key factors affecting energy efficiency. These are the R value of the species of log selected, its thickness and the shape or profile chosen. The shape affects energy efficiency because the wall is usually it its narrowest where the logs are stacked on top of each other. Machined logs are the most efficient as they generally use a full weight bearing cope system with a gasket in between. Hand scribed logs need to be cut expertly as it is harder to make the logs fit together without energy loss. 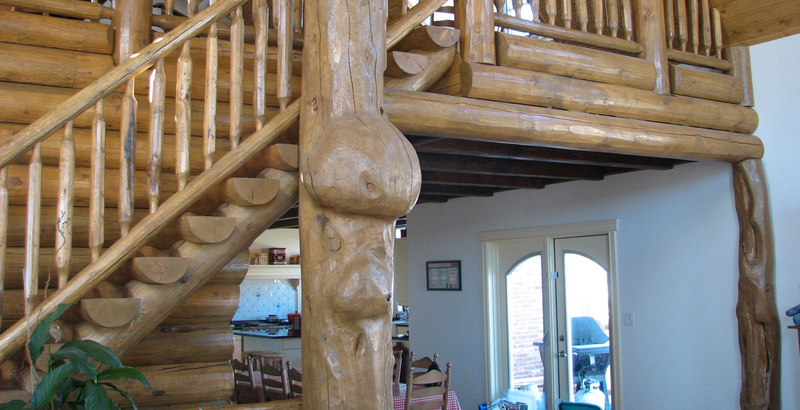 A concern for many log home customers is the R value of a log wall compared to conventional alternatives. New studies have been carried out by the Eastern Forest Products Laboratory in Ottawa. They demonstrate that the thermal resistance of wood, or the R factor, actually increases linearly with a decrease in temperature. In other words, the colder it gets outside, the higher the insulating value of your log walls. Engleman Spruce & Lodgepole Pine have proven to be a very energy efficient species to use in a log home mainly due the fact they are both open celled wood. The tiny open cells act as storage compartments for energy only releasing the stored warmth when required. 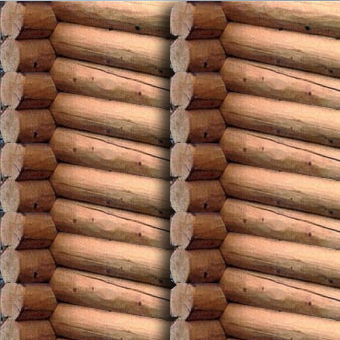 The use of a caulking or chinking material between the courses of logs on the exterior lateral groove helps to eliminate any potential air infiltration that may occur through the natural expansion and contraction that will be experienced in all log homes. This expansion and contraction will be most noticeable during the changing seasons. Where does Onward Log Homes ship? Typically we ship throughout North America. We also have experience in overseas shipping. What is the difference between kiln-dried and dry standing? Which is better? Dry standing logs come from trees that have succumbed to natural elements. The tree loses it's moisture and releases the sap while it is still standing allowing gravity to do the work. The free bourne moisture is released and the sap retaining cells are opened and drained naturally. Kiln-dried logs are generally cut from green living trees and are force dried to reduce the moisture content to a desired level. By force drying a log the moisture content generally provides a false moisture level which will increase over time until the natural drying process has completed. Kiln-dried logs are generally smaller in diameter due to the fact that it is difficult to force dry a large diameter log. It is difficult enough to kiln-dry a 4x4 lumber post not to mention a 12 inch diameter log. It is our opinion that a Dry standing tree is by far better than a Kiln dried log due to the fact that prior to the tree being harvested, Mother Nature has already completed her work by providing a solid, low moisture and virtually sap free log. Thanks Mom! Where can we install Onward's Tru-Log and Half Log Siding? Starting in 2002 we developed the Tru-Log and Half Log siding for clients that were constructing new Stick framed homes in Central Alberta. 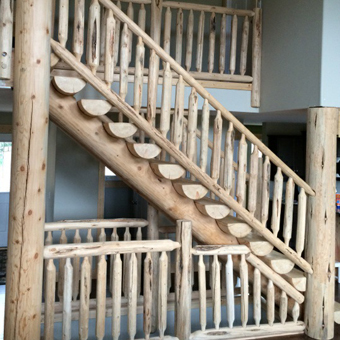 They wanted the beauty and appearance of a full log home on the outside and ease of maintenance of a conventional home inside with Log accents,railings and Stairs. 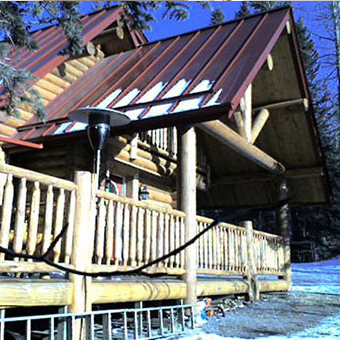 Since then we have provided hundreds of Tru-Log and Half Log Siding packages to clients in Western Canada. Over the years people that have seen our Tru-Log and Half Log Siding on new homes and cabins have asked us to provide packages to them for their renovation and addition projects. They have been very excited about the Log home look they have achieved. We have installed our Tru-Log and Half Log siding on many commercial and resort properties.This has worked very well for both new construction and renovations. 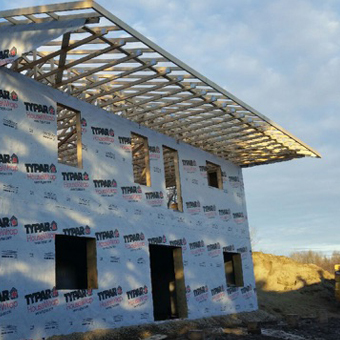 With the ease of installation of our Tru-Log and Half Log Siding many clients choose to install it themselves with a minimum of onsite instruction. We are only a phone call or email away and are always happy to answer your questions. Please remember that you can never start the planning process to early. While we are eager to help you through the process, we do have a revolving production schedule that is reserved on a "first come, first served basis."